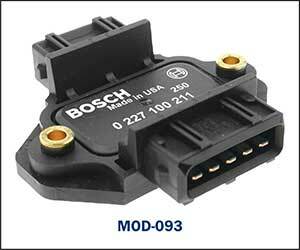 What Technicians need to know about Ignition module types, precautions, operation and testing. 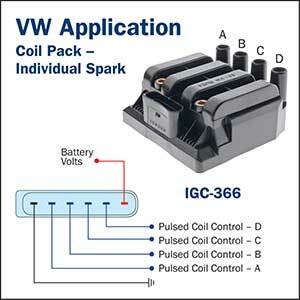 We all know that the purpose of the ignition module (a switching device) is to interrupt the current flow through the primary circuit of the Ignition coil to induce a high-tension spark for cylinder combustion. Even though the auto industry generally labels all switching devises as “modules”, there are many variations that must be identified by the technician due to different test procedures utilised to ensure correct operation. Typically: Ignition modules, Igniters, power transistors, DFI modules, TFI modules etc. This refers to distributor type and distributor less type ignition systems. Note: Distributor type systems may utilise a distributor mounted mechanical ignition vacuum advance mechanism, or the advance may be controlled electronically by the module and associated circuits. 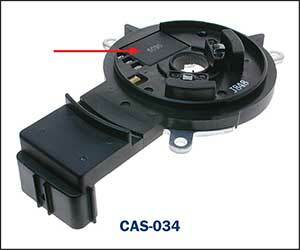 Typical examples of Ignition coil switching device purposes and their location. Single output module (located internal of distributor). This module utilises a directly connected inductive pick up coil and the reluctor for switching command. 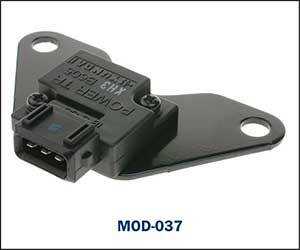 Positive and Negative ignition coil terminals are directly connected to this module. Single output module (located externally of distributor) with direct connected pickup coil. This module utilises a directly connected inductive pick up coil and the reluctor for switching command. Single output module (located externally of distributor) with ECU switching command. The inductive pick up coil signals are directed to the ECU for processing prior to the switching command being carried out by the ECU at IGT terminal which includes timing control. This module and pick up coil assembly directly connects to the ignition coil. 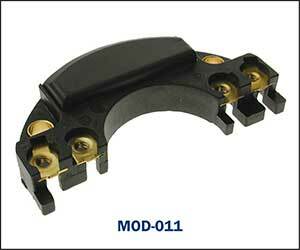 Typical multiple ignition coil output module for distributor less system. (DFI module). Three waste spark ignition coils are directly operated by this module with digital (Hall type) crank angle sensor signals utilised for timing control in conjunction with the PCM. Typical single ignition coil control- power transistor module. Can be used for both distributor and distributor less ignition systems. The ECU switching demand is amplified by the power transistor to directly operate the ignition coil. The ignition timing is calculated and controlled by the ECU. The ECU switching demands are amplified by the power transistors to directly operate each ignition coil. A 4-cylinder example is shown. (2 units fitted for 8-cylinder application) Ignition timing is controlled by the ECU. The igniter amplifies the ECU switching demand to operate the internally mounted distributor ignition coil. Ignition timing is controlled by the ECU and associated circuits. Typical integrated igniter and Ignition coil pack assembly. The igniter amplifies the ECU switching demands to operate the ignition coils as required. Ignition timing is controlled by the ECU and associated circuits. Typical integrated igniter and Coil over plug assembly. 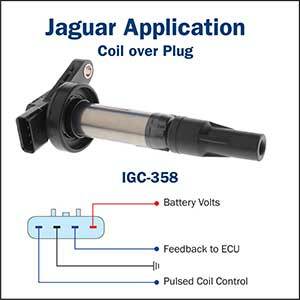 Each Ignition coil igniter amplifies the ECU switching commands to operate the ignition coil as required. Ignition timing is controlled by the ECU and associated circuits. Important precautions to be aware of when working with Ignition modules. Due to the current flow through the primary ignition circuit, excess heat needs to be dissipated to prevent damage to the Ignition module due to overheating. Generally, a heat sink paste / Dielectric grease is applied to the module mounting surface (if recommended by the manufacturer) when renewing a module. Renewing the ignition module or Ignition coil with an alternative replacement may cause premature ignition failure if the replacement components excessively increase the current flow in the primary circuit. Some ignition modules may be switched on and off by an inductive positive and negative voltage signal or by a square wave or digital signal. 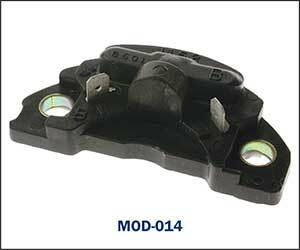 Fitting an incorrect module will generally result in a no start condition. Some modules may cause engine stalling when heated. Cooling the module rapidly with a cold spray may assist in diagnosis. This can include PCM units. Note: The correct pickup coil polarity utilised by the ignition module is essential for correct operation. Reversing the pickup coil polarity will result in extreme ignition timing inconsistencies. If the pink and white wires were reversed soldered on the module – the ignition timing would alter by approx. 20 degrees. The vehicle generally starts but performance is affected. Testing the ignition modules will vary depending on the type fitted. A suitable oscilloscope can assist with the testing of voltage signals to the module and also the output to the ignition coils. The Premier Auto Trade Ignition range includes more than 108 Ignition Modules (MOD), covering over 1.6 Million vehicle applications in Australia and NZ.